These socks are knit toe-up and feature all kinds of Kitsch you can probably imagine: glitzy little beads, lace, hearts in various shapes, techniques and sizes and even nested hearts with beads and lace combined. 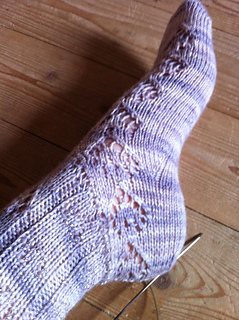 The heel construction is my own design and is a solution to the problem of letting a band (lace band, cabled band, …) flow uninterruptedly from the instep behind the back of the heel to the instep again. I hope you like it! 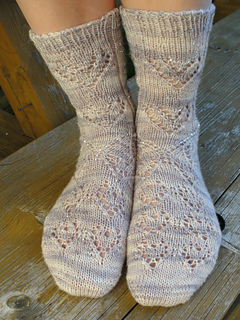 A photo tutorial on how to add beads to your knitting is included in the pattern. 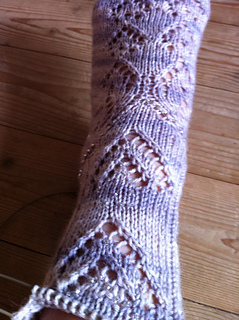 The pattern has been test knit carefully and should contain no errors. However, in case you find one please let me know and I’ll send you one of my patterns of your choice for free.